We've gone over this before, but I'll say it again.. 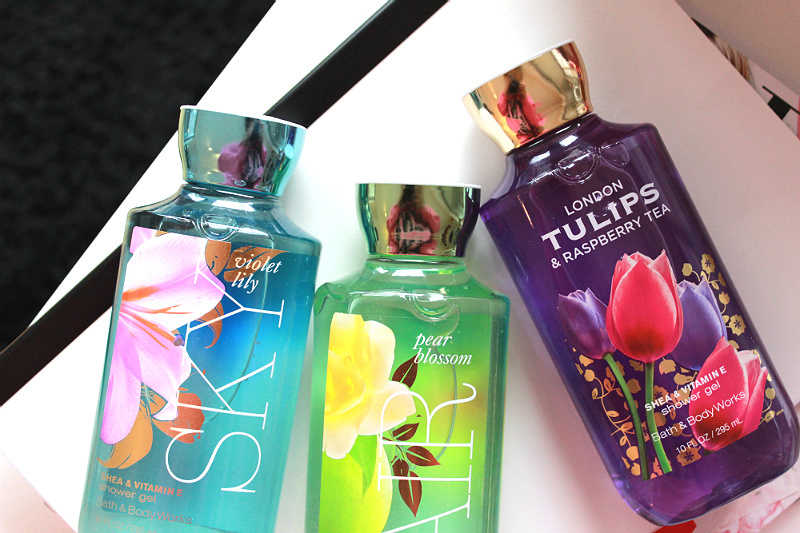 I am so bummed about not even remotely having any access to the full range of Bath & Body Works products. I am a big fan of their candles, but next to those they have amazing body care products as well. I bought one Shea & Vitamin E shower gel when I was in Los Angeles earlier this year, and quickly after ordered three more when a colleague was going to place an order during a crazy online sale on the official B&BW website. I still have three bottles left, so I'm carefully and slowly using these..
My favourite is definitely Violet Lily, although Pear Blossom is a similar soft dreamy scent. The shea butter in the formula leaves your skin feeling soft and nourished. These retail for $12.50 new, but the gorgeous thing about shopping in the US is that there's almost alway some sort of promo going on. As I am typing this out on Cyber Monday, they are currently retailing at $3.75 each. That's a completely crazy good price for a luxurious shower gel like this, and if I could I'd definitely stock up.. I'm already looking forward to my next USA trip & will make sure my carry-on bag is big enough to stock a load of these. Please Bath & Body Works, make your way to Europe soon..